This art piece is a combination of three egg shells. 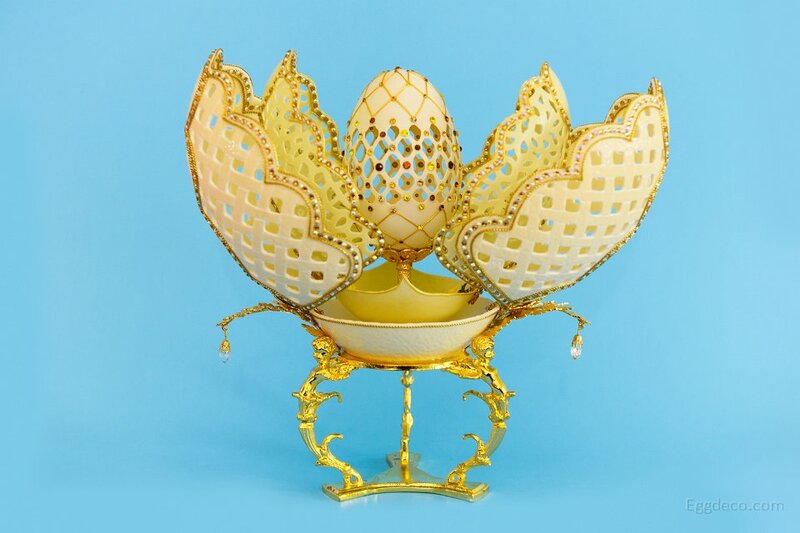 The bottom egg is a Rhea Egg shell, which is placed horizontally and intricately carved into two pairs of symmetrical petals, each pair with a different pattern. The middle Rhea Egg is mounted vertically and minutely carved into three petals and three sub-petals. It is lined all around the edges with different shades of flat-back rhinestones. 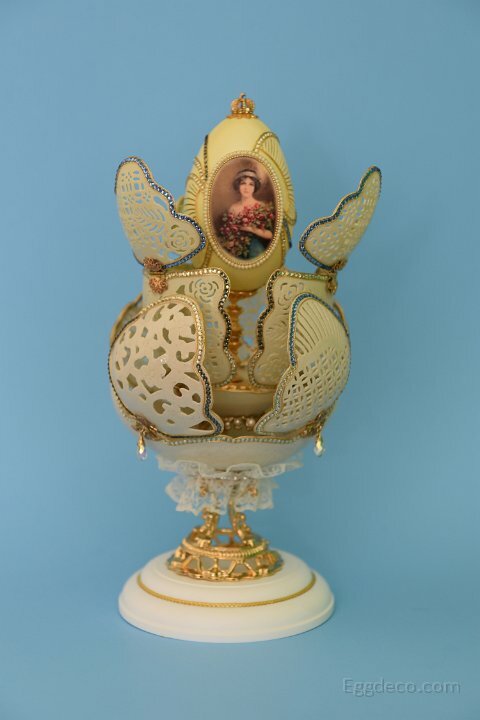 A yellow painted Goose Egg is placed on the top and decorated with a silk transfer depicting a lady holding a bouquet of flowers. Nirvana is a combination of three different egg shells – Ostrich, Rhea & Goose eggs. 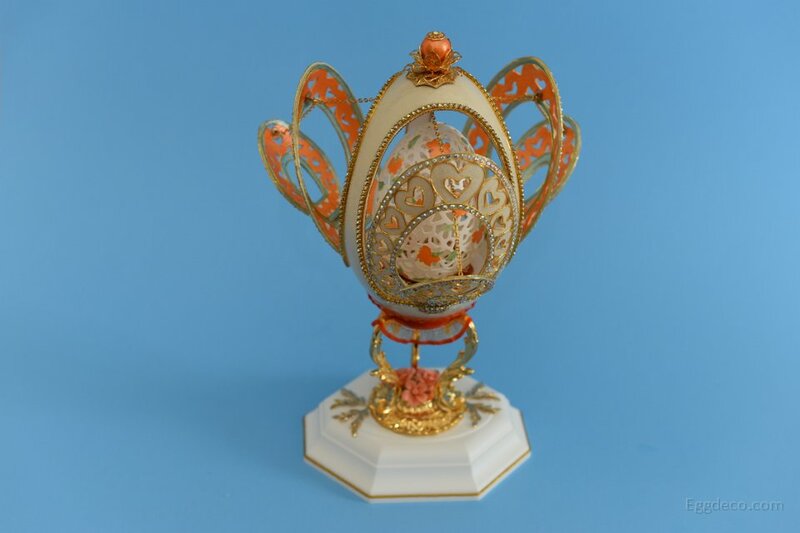 Each of these egg shells are intricately carved and cut in the form of petals and joined to the base with the help of hinges to open like a flower. 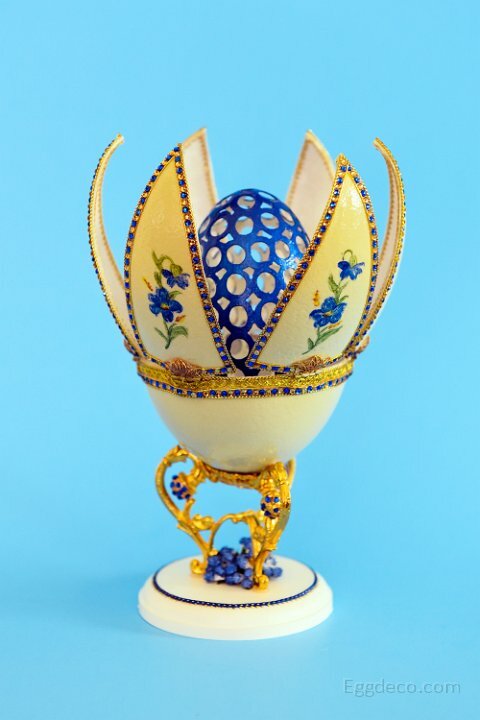 The eggs are decorated with golden cord and ornamented with flat-back crystals on the edges of the shells. Rhea Egg is intricately carved and cut to form two arched petals on three sides. The arches are held together by a golden chain. A completely carved and painted Goose Egg is placed inside the Rhea Egg to form this combination piece, denoting the onset of the spring season. A Rhea Egg is cut in the form of feathery petals and sub-petals. The three main petals on each side are decorated with water-sliding transfers. 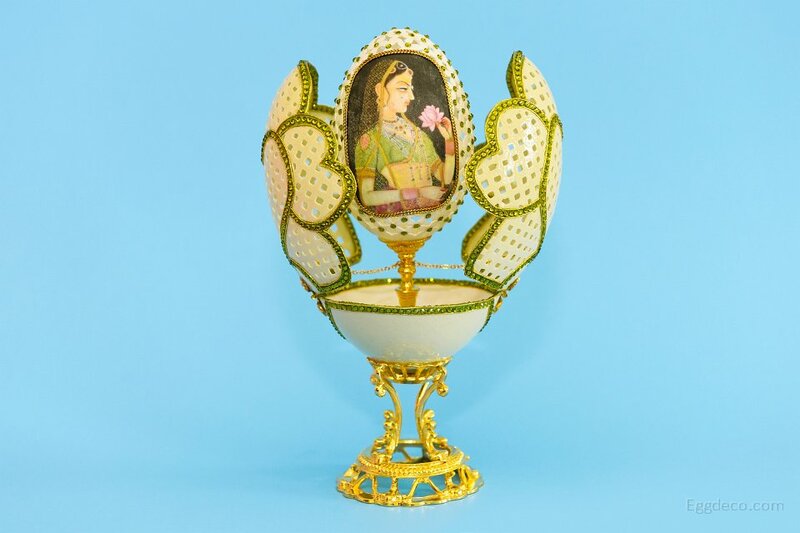 A Goose Egg shell is carved in Mughal pattern and decorated with silk transfers depicting the Mughal ruler Shah Jahan and his beloved Mumtaz Mahal. 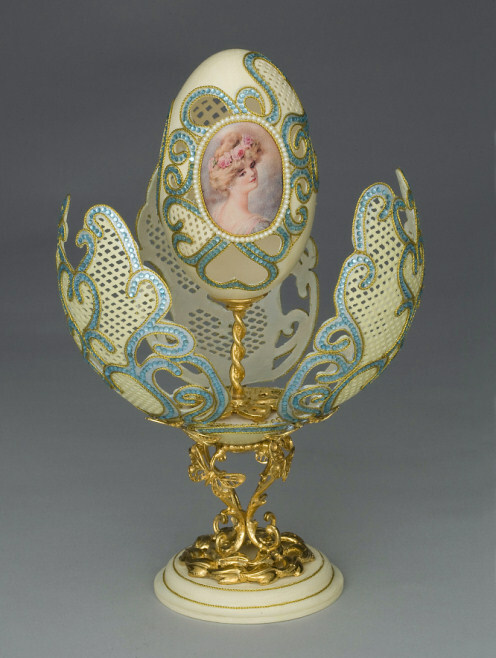 The egg is mounted on a golden floral stand holding two Dove eggs decorated with water-sliding transfers. Rhea Egg is carved in the form of an open flower using meshed pattern. It is painted on the edges with green acrylic paint and lined with flat-back rhinestones and golden cord. 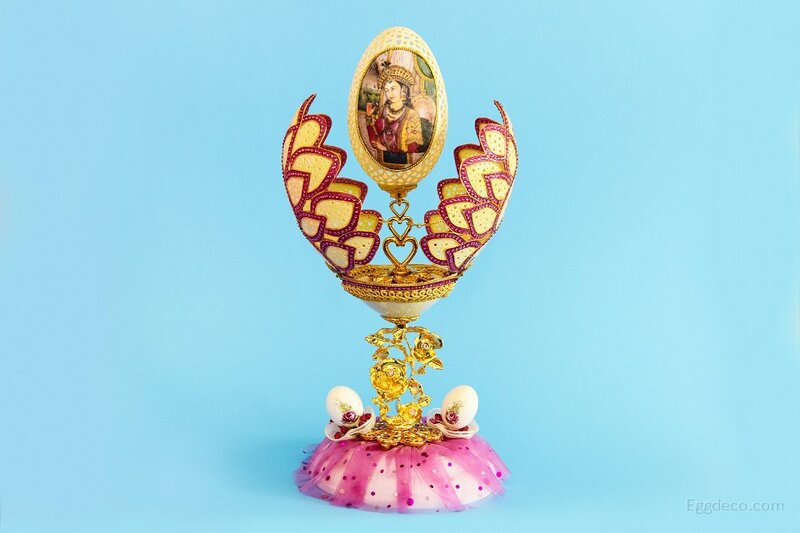 A completely carved Goose egg which is decorated with a silk transfer, portraying the legendary queen Rani Padmini (Padmavati) is placed inside the Rhea Egg. The two petals are held together by a thin golden chain. 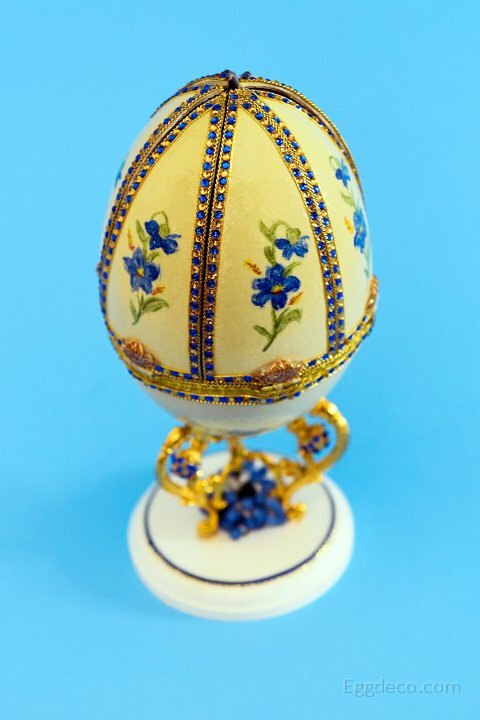 Rhea Egg in which six petals are cut out and decorated with small hand-painted flowers. 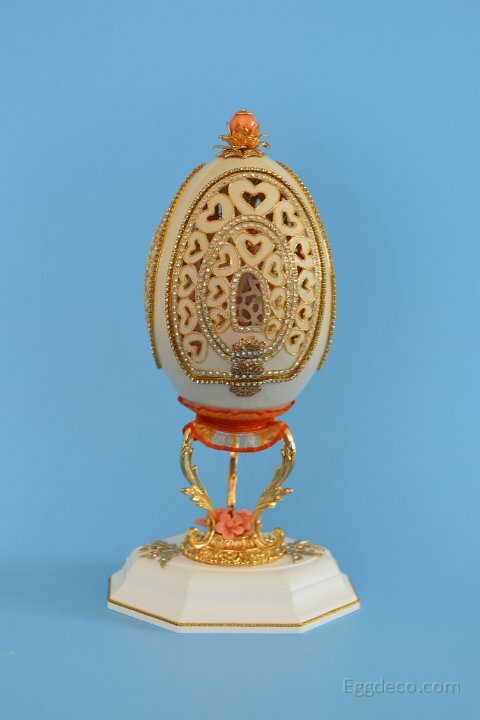 A Goose Egg with spiral cutting is placed in the Rhea Egg to form this combination egg art piece. Rhea Egg is carved and cut in the form of two flower petals. Each petal is intricately carved and the edges are decorated with golden cord and flat-back crystals. Water-sliding transfers portraying romantic couples are affixed in the middle of the petals. A completely carved Goose Egg decorated with a silk transfer depicting a lovely couple is placed inside the Rhea Egg. The two petals are held together by a thin golden chain. 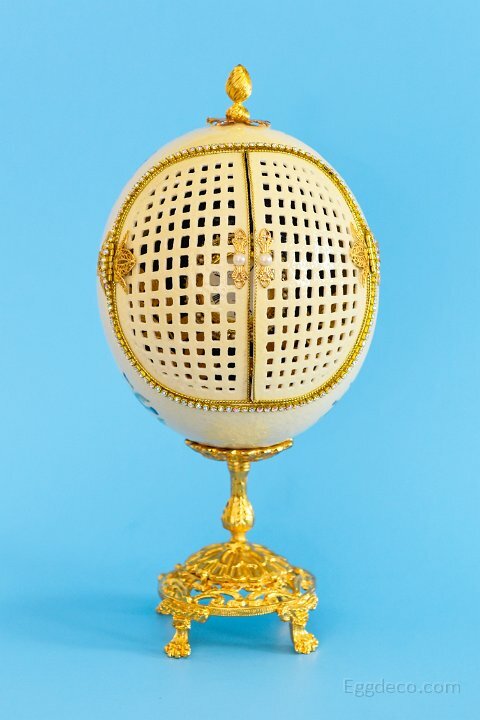 This extraordinary piece of egg art is a fusion of intricately carved Rhea egg and a Goose egg. 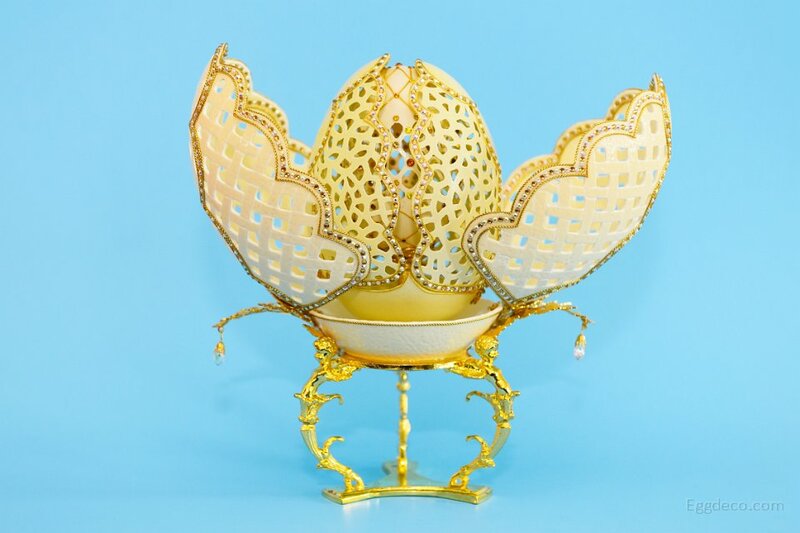 Rhea egg is cut and elaborately carved into three delicate petals which are embellished with golden cord and ornamented all around with pseudo-crystals. The petals open to hold a minutely carved goose egg, which is adorned with a silk print showing a beautiful lady. 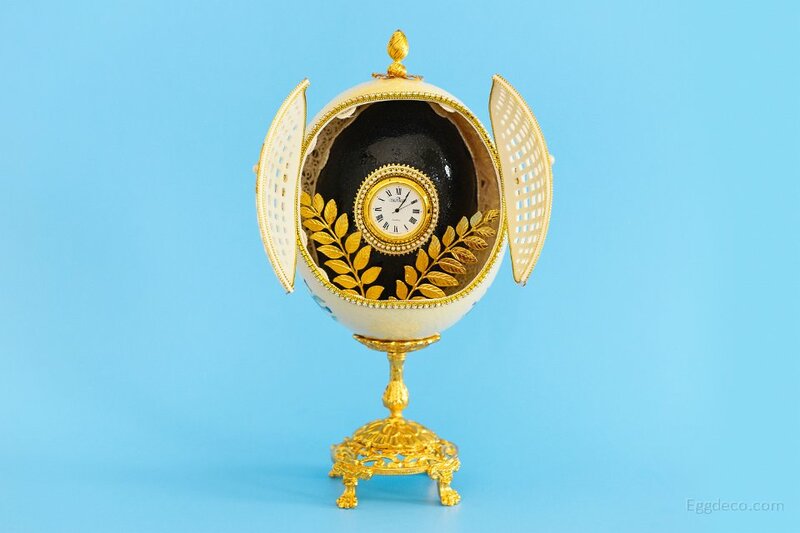 Emu Egg shell with a working clock decorated with two golden leaf filigrees is placed inside an Ostrich Egg. The Ostrich Egg shell is carved in an interlaced pattern on the front side and two doors are opened to unveil the Emu clock. Ostrich Egg is engraved all around with flowers and leaves. Three rhomb-shaped lattice patterns are carved on the rear and side faces of the egg shell. The shell top shows floral carving surrounded by Islamic calligraphy. Two doors are cut in the front portion of the egg to create an opening. 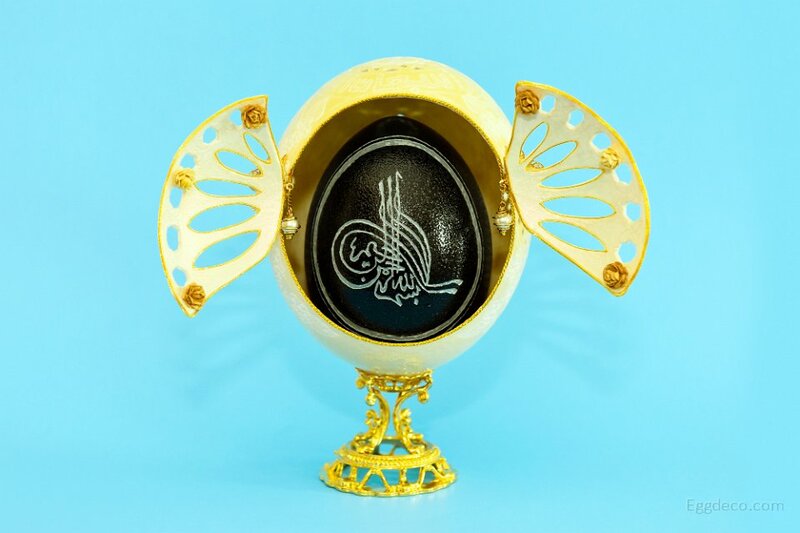 An Emu Egg with Islamic calligraphy etched on it is placed inside the Ostrich Egg. 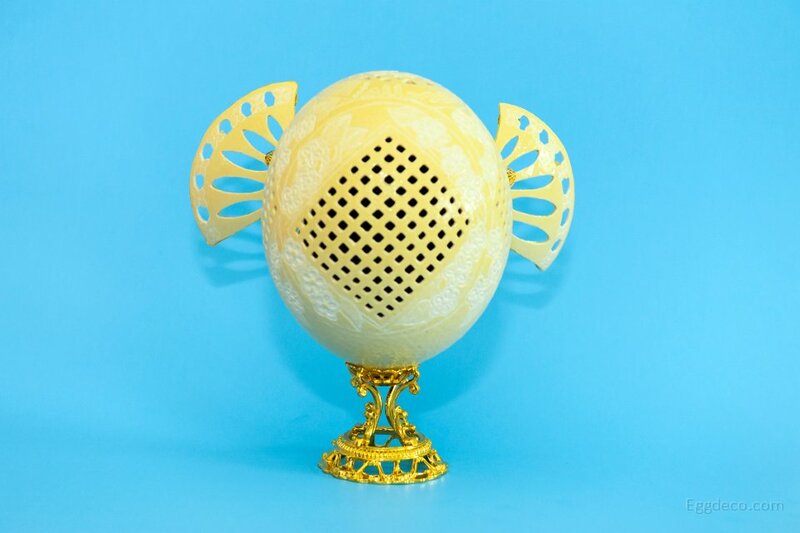 This Egg art piece is a fusion of Ostrich and Goose Egg shells. The Ostrich Egg is cut to form the body of the teapot while the four Goose Eggs are cut to form two cups, creamer and sugar jar. The spout of the kettle and handles made of ceramic are painted with blue acrylic paint. 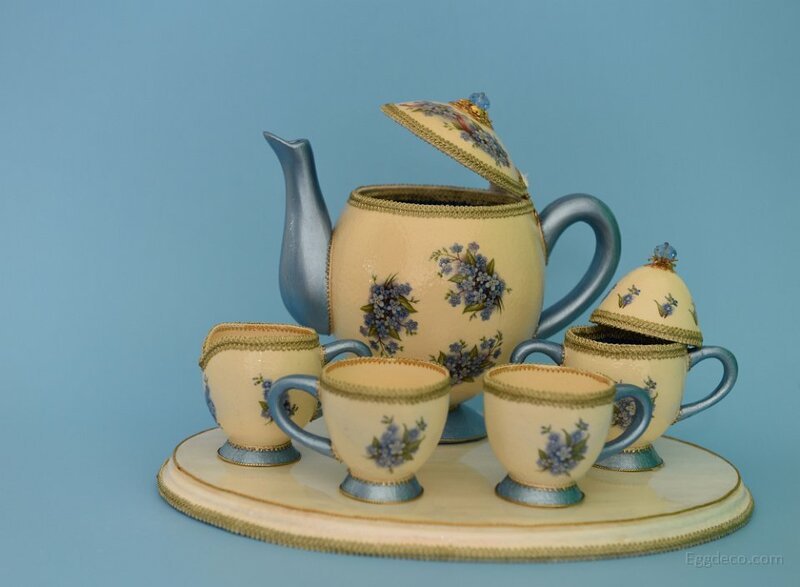 The base of the teapot is made of Ostrich egg shell while the other bases are made out of Araucana egg shells. 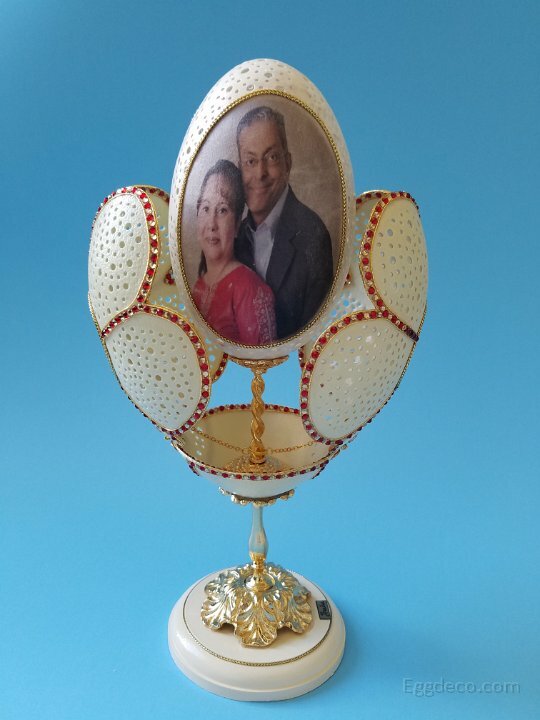 This egg art piece is a fusion in which an Ostrich egg is converted into an elegant tea pot while two Goose eggs serve as cups.The Ostrich egg is lined with pink satin from inside. 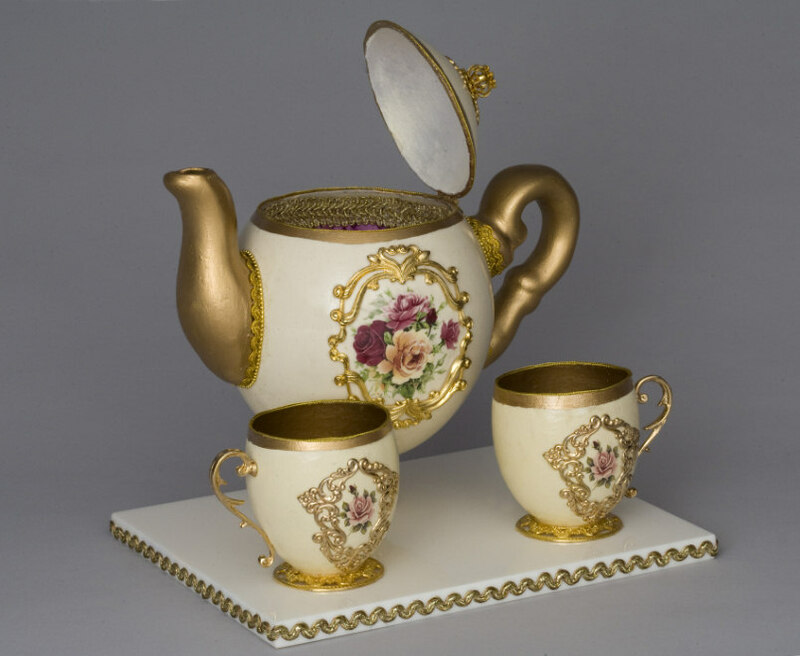 The spout and the handle of the teapot are painted golden with liquid gold leaf. Two Goose eggs are painted with cream coloured acrylic paint and are cut in the shape of teacups. Liquid gold leaf is painted inside and on the outer rim of the cups. 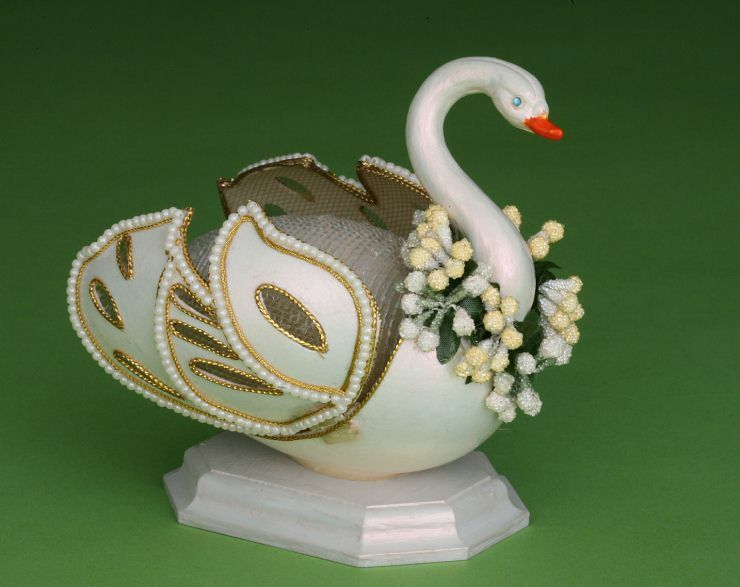 In this creation a Goose egg is cut in the form of two delicately carved wings, which are ornamented with pure white beads and hinged on the sides. The neck of the swan is painted and decorated with pretty flowers. 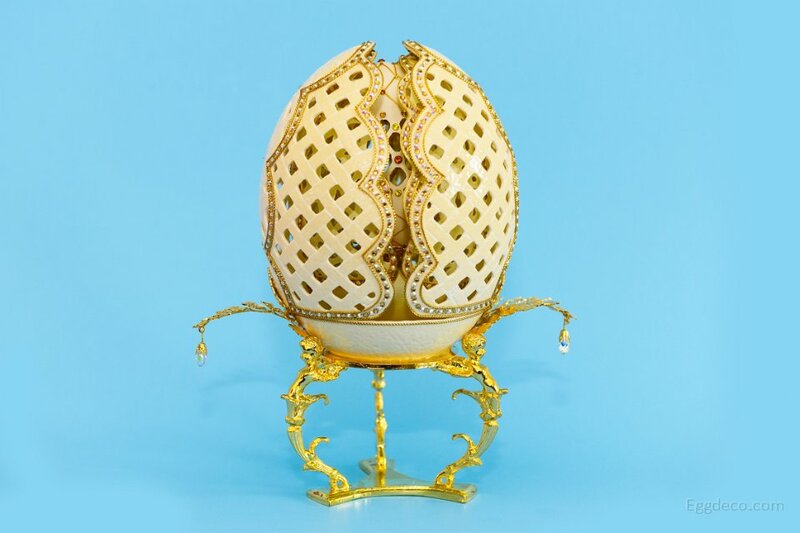 A Turkey egg decorated with sequence beads duplicates as the body of the swan. This is a pristine set of xanthous cameos, comprising of Goose and Araucana (smaller) eggs. 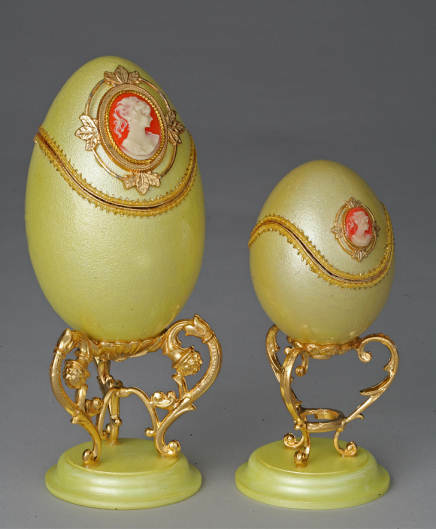 Both these eggs have similar scallop or Prussian cutting and are decorated on the top with beautiful cameos. The eggs are lined inside with heavy maroon brocade.